So I signed up! You should, too :-) Here is where you can get more information. Sign-ups are open until November 12th. Cheers! Also, in my weirdly holiday-tastic mood, I have signed up to participate in this year's Advent Calendar! Not at all sure what that will entail or involve, but I'm gung-ho about doing it (again- remember my motto. Go big or go home!). Once that website is up and running, I'll come back with more information. And lastly, Kristen M and I are still planning on hosting a re-read challenge for 2010. If you have ideas for Challenge names, let me know. We are open to suggestions! More information to come on that, including sign-ups and themes, etc. in December. The website for the Advent Calendar will hopefully be up soon! Glad you are going to be participating! the swap sounds like fun. i'll give it a go. and i love online advent calendars. Yay I signed up to this, so excited! Hooray! Very glad you joined the Swap! I'm looking forward to the advent calendar and the challenge also! The swap sounds like fun! Two great challenges! Women Unbound and the Re-read. Good luck to you! oh goodie - I just wrote (not yet published) a post for a re-read challenge for myself but I'll wait and do with whatever you come up with. I was going to call it "Re-Reading is Dejavu to me all over again." or something. Have fun with the swap! I'm in, too and am already thinking up some reading-themed goodies. I know this is a bit belated but I wanted to thank you for cheering for me in the Read-A-Thon. 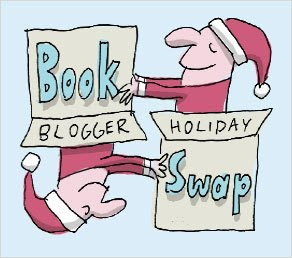 The Book Blogger holiday swap sounds great.